The Bishop’s Pro-Life Dinner on April 14th was a great success, bringing in record proceeds for the CPLC’s nine ministries to continue operating and saving lives over the next year. We are indebted to all of you who helped make it happen, including promoting, volunteering, attending and praying for the success of this event. Be sure to check out www.prolifedallas.org/dinner for post-dinner coverage, including photos – congratulations once again to Mater Dei Parish Pro-Life Coordinator Angela Heiter, the 2012 Father Edward Robinson, O.P., Pro-Life Person of the Year – and special thanks to all those who planned and sponsored this most memorable evening for life. And if you didn’t have a chance to see the CPLC’s 2012 ministry video, please watch it here and share it with your friends!
. We want to hear from you! May 29: Texas Primary Elections (early voting May 14-25) – Cast your vote for life! or 972-267-LIFE (5433). Also, the U.S. Catholic Bishops have released another wonderful teaching tool: Religious Liberty, The Most Cherished of American Freedoms (en español). 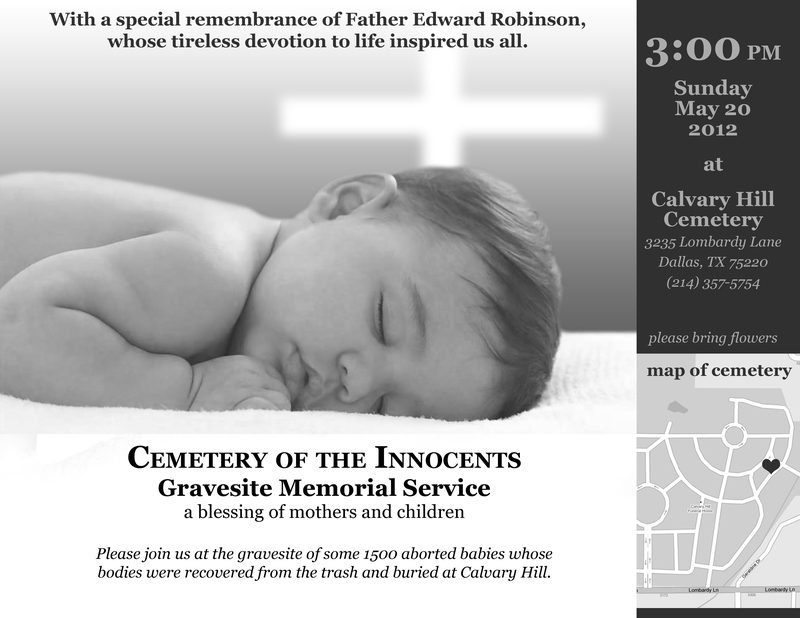 If you have not seen this bulletin insert at your parish yet, please ask your Pastor about including it this month. As mentioned above, our next Quarterly Parish Pro-Life Coordinators Meeting will be on Saturday, May 12, from 9 a.m. to 12 noon at St. Michael the Archangel, 2910 Corn Valley Rd, Grand Prairie. Please remember to retrieve your two Bishop's Dinner yard signs and return them at the meeting, or if you cannot attend the meeting, please bring them to the CPLC office. Finally, as we approach summer, Youth For Life is preparing for its exciting tenth anniversary of Pro-Life Boot Camp, featuring Father Tad Pacholczyk of the National Catholic Bioethics Center. Registration is now open for youth, ages 14-17, who are entering high school, and chaperones are needed. Visit www.prolifedallas.org/bootcamp for more info and please spread the word to your fellow parishioners about this fun and educational experience for teens.